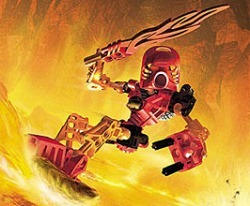 Tahu is the fiercest of the six Toa, and the most feared--you don't want to get into a fight with Tahu if you can help it. He is most at home in the hot molten world of the Mangai Volcano where he surfs on lava flows, using his sword of flames to cut through rocks and keep the lava moving towards the ocean. His flaming temper can make him hotheaded and irrational sometimes. He has the least patience of the Toa and often jumps into a situation without thinking, which can get him, and the other Toa, into trouble! Gali is the only female Toa and incredibly wise-perhaps wiser than all the other five Toa put together. The villagers of Ga-Koro are incredibly loyal to Gali and believe she is the sustainer of life. But if she gets angry, look out -- tidal waves and rainstorms flood the island! 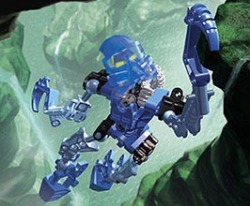 Gali is the most agile and gymnastic of the six Toa. She has incredible jumping abilities and her own brand of acrobatic self-defense. The only things that can slow her down are excessive heat and drought. Gali is at home both in and near the waters of Lake Naho. She swims quickly through the waterfalls that plunge down into the icy water, using her two hooked arms to grab onto rocks and cliffs. She works in harmony with the waters, which help to protect her in times of danger. Pohatu is so immensely strong that he can literally move mountains. He can make massive rocks explode like bombs or roll with great precision towards an attacker. His huge feet contain great power, smashing even the most unyielding stones with a single kick! 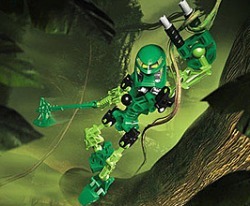 All the Toa like Pohatu for his kind nature and for his rock-solid dependability. He's slow, but friendly and reliable. He's not good at snap decisions, but when he makes a decision to do something, he stands firm until the end--so DON'T get in his way! 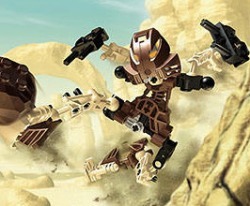 Whenever there is trouble, Pohatu will always be there behind you, an immovable force that few enemies can dislodge. His only fear is water: he cannot swim, and he sinks...like a stone. Pohatu inhabits the foothills of Mount Ihu, moving slowly but sure-footedly among the rocks and boulders at the base of the great mountain. Kopaka is cool, calculating and methodical in his actions. 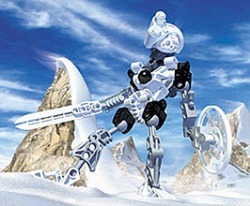 His long ice blade cuts and melts ice; one skillful swipe can cause avalanches or instantly freeze anything it touches. It is believed that Kopaka brings the winters, and the long cold nights...and it is known that his power strikes a balance against the fiery presence of Tahu. Kopaka prefers to work alone. He is the least communicative of the Toa, and will only join forces with the others if it's absolutely necessary for his own survival. Kopaka is most at home skiing up and down the slopes of Mount Ihu with blazing speed and unmatched skill. Lewa is supremely competent with aerial activities. He glides through the air with ease while jumping from tree to tree. His axe effortlessly slices through trees and vines as he climbs through his jungle around Kanae Bay. Lewa prefers to inhabit the treetops because he is somewhat clumsy on land and flat surfaces. Lewa is quick to jump to conclusions--and he's the first to get into trouble. But his instincts are often true, and his hunches frequently turn out to be correct. If there's a fight, he's always the first to jump in, protecting others before himself. Onua is at home below ground. With his huge hands he scrapes out tunnels in the rocky cliffs over Papu Niho Reef. 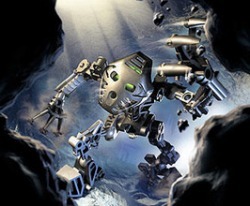 His low, squat body and head allow him to move quickly in tunnels and his infrared eyes give him amazing night vision. In daylight his eyesight is poor, although he compensates with amazingly powerful hearing. He is slower on open land than underground, but has incredible strength and surprising dexterity. Onua is at one with the land. He can hear trouble coming from miles away, and on occasion can even persuade the landscape to do his bidding-which is very useful when under attack.